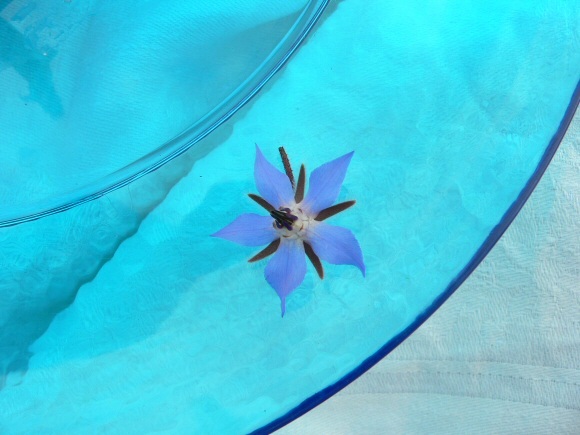 My photograph for 2008 was of a blue borage flower on a clear blue & white curved geometric background. It was not a planned studio shot but just an almost accidental arrangement at a picnic (borage flowers are edible & were in a salad, the blue is was a transparent plastic plate and the white was a table cloth) with friends in the grounds of Orwell Park at Nacton in Suffolk, UK in 2008. The 'almost' was because I spotted good colour combination with the plate on a drinks table with mixed salad on and spent a few seconds moving the plate to a table cloth on the ground and moving the flower to a clean part of the plate (hence there is a practical reason the flower is on the plate rim not just to show the tablecloth!). After quickly taking the shot vertically downwards, I resumed my picnic by eating the subject of the photograph.